Employee stock-ownership plans can be complex to set up. But at local companies ranging from Charter Construction to pet-supply retailer Mud Bay, an ESOP gives workers a financial and psychological stake in the enterprise’s success. A chance conversation on a ski hill led to a dramatic turn of events for Peter Saladino, the president and then-majority owner of a Seattle construction company. Saladino was vacationing in Montana when a ski partner talked about an employee stock-ownership plan, or ESOP, that turned workers into owners. Intrigued, Saladino looked into an ESOP for his company, Charter Construction, which has about 220 employees. Saladino, 47, wasn’t thinking about selling or his own retirement. Instead, he was looking for an ownership structure involving his colleagues that would carry the company well into the future. His leadership team agreed an ESOP was a good idea. After months of preparation, Charter Construction launched its own ESOP plan on Sept. 30. Employees who work more than 1,000 hours a year are eligible. Eventually, the company will be 100 percent owned by its workers. Charter Construction joined the ranks of more than 100 companies in Washington that give employees an ownership stake with an ESOP. They range in size from a Redmond financial-services company with two ESOP participants to Boeing, which has about 211,500 employee and retiree participants nationwide with stock in the company. Other recognizable local companies with ESOPs include pet-supplies retailer Mud Bay, wholesaler Charlie’s Produce, Timberland Bank and engineering firm Hart Crowser. Studies have documented the benefits of employee ownership, especially in regard to workplace behavior and business performance. ESOPs also come with federal tax benefits. Employee ownership is not without headaches, however. ESOPs are complicated, and workers who overload retirement accounts with their employer’s stock are at risk if the company runs into trouble. 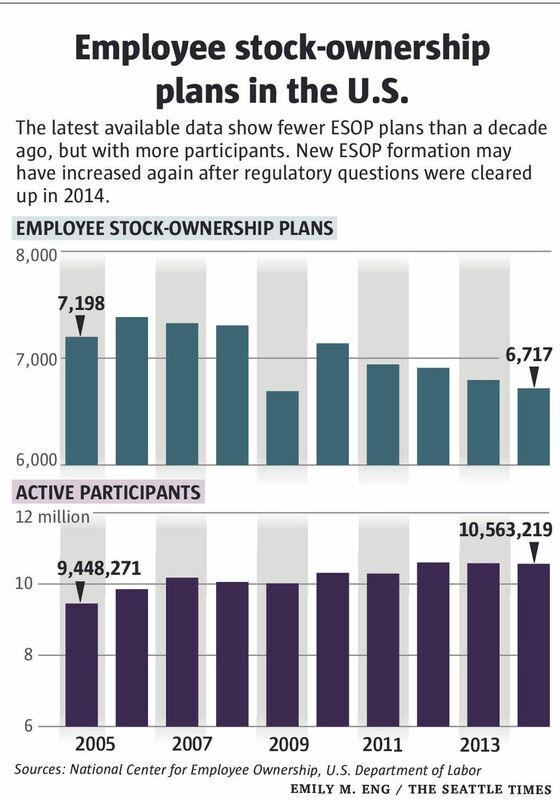 Despite the known benefits of employee ownership, the number of ESOP plans nationwide declined between 2006 and 2014, the most recent year for which complete data are available. Some people on the front lines of ESOPs are seeing signs of a rebound, however. Charter Construction’s executive team knows how involved an ESOP conversion can be. Saladino and his business partner Eric Jackson sold their shares in the company to an ESOP trust managed by a third-party trustee. The trust borrowed money, with the company as an intermediary, to buy the shares. Meanwhile, Charter Construction supports the trust with annual contributions, which the trust uses to repay the loans. The trust owns the shares and assigns them to employee ESOP accounts with a vesting schedule. Charter Construction also provides a 401(k) retirement plan. When vested employees leave the company, they cash out by selling the beneficial interest in their ESOP shares back to the trust. Charter Construction had to hire outside accountants, attorneys and trustees to walk it through the ownership conversion. The expense of advisers and closing costs added up to between $250,000 and $300,000. That expense was manageable for the company, which has an estimated annual revenue between $70 million and $80 million. Saladino says it was worth it. He saw an ESOP as a way to recruit and keep good employees — and to reward them for staying. He also wanted an ownership that would keep the company going for another 100 years. The tax benefits were icing on the cake. “When I weighed all of that, I thought, ‘This is a no-brainer,’ ” he said. 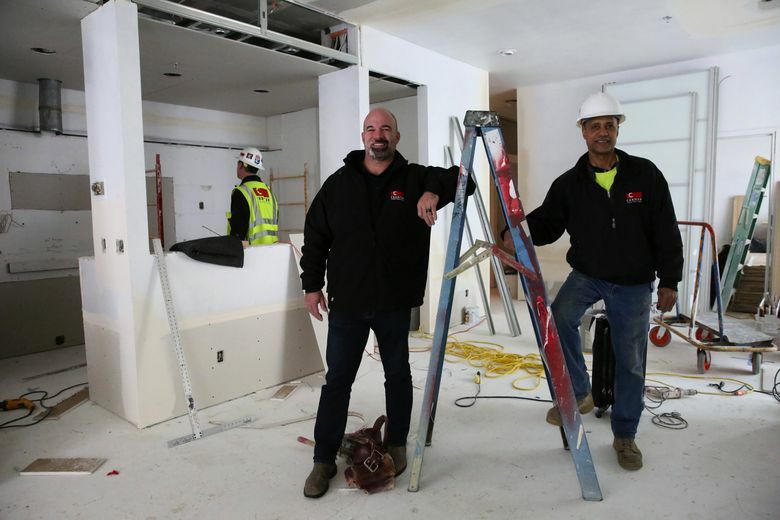 One of Charter Construction’s new owners is Anthony Boyd, 51, a carpentry foreman who has been with the company for 12 years. He now gets an ESOP statement in addition to his 401(k) retirement report. Boyd said workers feel more engaged with the company. “I’m working a 9-to-5 job, but it’s more than that,” he said. “I’m working for my company. ESOPs are the most common form of employee ownership, although there are several non-ESOP alternatives. Businesses can grant stock options to their employees, a familiar practice among startup and tech companies on the West Coast. Companies can offer stock-purchase plans. Or they can let workers hold shares of company stock in 401(k) accounts. Another non-ESOP form of employee ownership is used to compensate top management. Corporations often pay top executives with stock options or grants. Dara Khosrowshahi, chief executive of Bellevue-based Expedia, was the nation’s best-paid CEO in 2015 because of his stock compensation. The online travel company paid Khosrowshahi $94.6 million that year, almost all of it consisting of stock options tied to performance targets. Some studies show that employees at ESOP companies tend to be more loyal, more collaborative and more hardworking, said Dan Weltmann, a researcher and doctoral candidate at Rutgers University. Weltmann was part of a Rutgers team that examined hundreds of private companies to see whether ESOP conversions affect survival rates. The study, published in 2013, found that those companies were much less likely to disappear than their non-ESOP counterparts. They also posted much higher job and revenue growth after making the switch. The federal government encourages ESOP formation by offering tax-break options for owners, companies and employees. For example, Charter Construction no longer has to pay federal income tax because it converted to an “S corporation” with 100 percent employee ownership. Taxable income flows to the shareholder — the ESOP trust — but it is tax exempt. Employees who leave the company and sell the beneficial interest in their shares to the trust are subject to tax; but if they roll their money into a retirement plan, it isn’t taxed until withdrawn. Despite the encouraging research and tax breaks, the number of ESOP companies nationwide fell 9 percent to 6,717 between 2006 and 2014, according to federal data compiled by the National Center for Employee Ownership in Oakland, Calif. The number of ESOP companies in Washington sank 9 percent to 105 between 2010 and 2014, the data show. One reason for the decline was the U.S. Department of Labor’s heightened scrutiny of ESOP valuations, which created uncertainty in the marketplace, said Loren Rodgers, the center’s executive director. That uncertainty eased in 2014, when the department settled with a large ESOP trustee, the GreatBanc Trust Co., Rodgers said. The settlement terms gave ESOP advisers nationwide more guidance on how to stay on the right side of the regulations. Private equity firms have also become more aggressive buyers of businesses in recent years, giving company owners an alternative to transferring ownership to their employees. Finally, many owners may be unaware of the ESOP option when they begin thinking about selling their business. The process of converting can be daunting. “There are a lot of moving pieces,” said Nick Braun, vice president at the Portland office of Chartwell Financial, a national consulting firm with a large ESOP practice. Most ESOP conversions take between three to six months, although a number of variables can affect the timetable. Braun likened the conversion to buying a house: It’s complex but usually successful with the right preparation and advisers. Some are seeing renewed interest in ESOPs since the Labor Department cleared up the regulatory uncertainty. Braun says ESOP conferences are attracting more companies, and his firm is getting more inquiries about the ownership model. “We’re seeing good tail winds,” he said. Employee ownership is deeply embedded in the culture of Perteet, an Everett-based engineering-consulting firm. It became a partial ESOP company when its founder sold out 11 years ago. The company converted to 100 percent employee ownership in 2009. “I believe it matched the culture of the company. 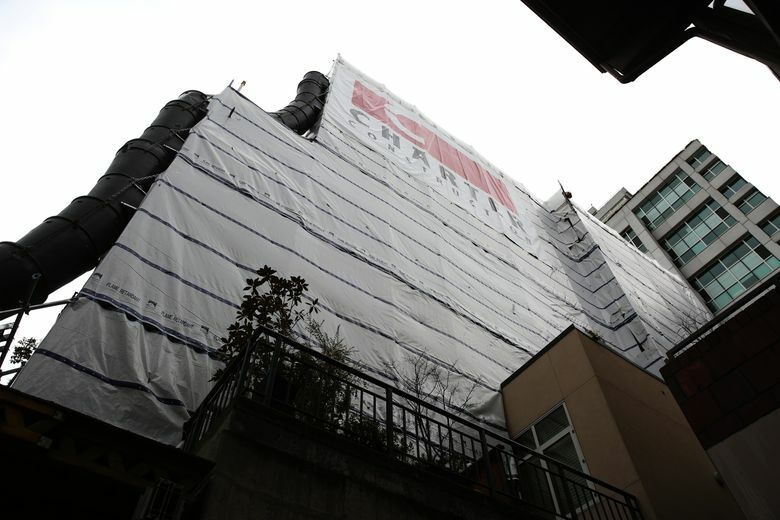 That’s the most important thing,” Perteet President and CEO Crystal Donner said at the firm’s Seattle office. She sees the ESOP as a way to attract and motivate good workers. It also helps differentiate Perteet, with about 80 employees, from its bigger rivals in a competitive industry. Finally, Perteet’s ESOP provides a retirement benefit in addition to its 401(k). In many ways Perteet resembles a typical company. Donner, her executive committee and the board of directors make the big decisions, for example. But in other ways Perteet is different. At the beginning of the year, the company shares its business plans — including revenue and earnings targets — with all its employees. Donner distributes weekly “The Good, the Bad and the Ugly,” a real-time appraisal of the company’s performance. New hires get a crash course in corporate finance from Perteet’s chief financial officer. All of this has affected the company’s culture. When Perteet last year installed a new company logo on the wall of its Seattle reception area, two outlets for an earlier flat-panel television were visible behind the logo’s transparent backing. So the company asked the building manager how much it would cost to remove the outlets and patch the wall. Robin Nunnally, an administrative assistant with a flair for design and an eye on expenses, opened the repair estimate and was taken aback. The estimate was for $1,000. “It seemed a little outrageous to me,” she said. Instead, Nunnally found extra wall paint in a backroom and brought one of her small paint brushes from home. She also found some heavy card stock and gave it three coats of paint. Then Nunnally attached the painted card stock on top of the outlets with tape. Her solution blends so well with the wall that few people notice unless someone calls attention to it. Best of all, “it pretty much cost nothing,” Nunnally said. She had just saved Perteet — her company — $1,000.